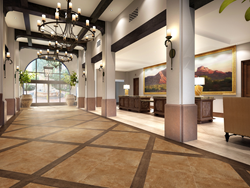 Slated to be completely transformed by April 2016, the team at the future Embassy Suites is designing the property to be a distinctly Scottsdale urban retreat. “We’ve overhauled every aspect of the hotel, inside and out, to create a luxurious oasis in the heart of downtown Scottsdale,” said Alan Klein, general manager of the Chaparral Suites Scottsdale, soon-to-be Embassy Suites by Hilton Resort Scottsdale. Shivering travelers will feel the warm sun as they step onto the grounds of the 15-acre hotel and resort that will soon be the Embassy Suites by Hilton Scottsdale Resort. As the renovation team puts the final touches on the $25 million transformation guests can get a sneak peek, as well as 25 percent-off room rates with the promotional code “Peek” for a stay anytime between now and March 31, 2016. Slated to be completely transformed by April 2016, the team at the future Embassy Suites is designing the property to be a distinctly Scottsdale urban retreat, with traditional terra-cotta rooftops, a massive lobby mural of Camelback Mountain, local art and memorabilia, and natural landscaping with indigenous plants. The hotel currently includes 312 freshly updated and modernized guest suites, all of which feature two rooms or more. Luxury executive and VIP suites will be finalized by April 2016 and will include multiple bedrooms and will be ideal for family gatherings, golf trips and girls’ weekends. Guests can also enjoy the 2,000-sq.-ft. fitness center with Life Fitness equipment, and the newly renovated Agave and Cholla pools with whirlpool. The hotel is located at 5001 N. Scottsdale Road, Scottsdale, Arizona 85250. To book a room reservation or get more information, visit http://www.chaparralsuites.com or call + 1 800 528 1456, and use the promotional code “Peek” for the 25 percent discount. For more information on the Embassy Suites by Hilton brand, please visit http://www.embassysuites.com. Chaparral Suites, soon to be Embassy Suites by Hilton Scottsdale Resort, is open for business while completing a $25 million renovation to upgrade every element of the 15-acre property. Located within walking distance of Scottsdale Fashion Square, Old Town Scottsdale and the Scottsdale Waterfront, the hotel features 312 upgraded guest suites, including multiple-room executive and VIP suites, and 60,000 sq. ft. of flexible meetings space, which includes an 11,000 sq. ft. conference center. Plenty of modern and comfortable indoor and outdoor space add to the resort feel of the property, ideal for weekend travelers, families, weddings, and meeting-goers. Chaparral Suites was purchased in 2014 by Snyder Nationwide Real Estate, Inc., and renovation is expected to be completed in Spring 2016. For more information visit http://www.chaparralsuites.com or http://www.embassysuitesscottsdale.com. Embassy Suites by Hilton, one of Hilton Worldwide’s twelve market-leading brands, is dedicated to delivering what matters most to travelers. The full service, upscale brand offers two-room suites, free made-to-order breakfast and a nightly two-hour reception with complimentary drinks and snacks. Both leisure and business travelers looking for a relaxed, yet sophisticated experience will feel right at home with brand-standard amenities like inviting atriums and complimentary 24-hour business and fitness centers. Embassy Suites by Hilton has over 220 hotels with more than 40 in the pipeline. Hilton HHonors members who book directly through preferred Hilton channels have access to benefits including free standard Wi-Fi, as well as digital amenities that are available exclusively through the industry-leading Hilton HHonors app, where HHonors members can check-in and choose their room. For more information, visit http://www.embassysuites.com, and connect with Embassy Suites by Hilton at news.embassysuites.com, http://www.facebook.com/embassysuiteshotels and http://www.twitter.com/EmbassySuites. About Snyder Nationwide Real Estate, Inc.
Snyder Nationwide Real Estate, Inc. is a longstanding, international hotel brokerage company based in Scottsdale, Ariz., which specializes in the brokerage of hotels throughout the U.S., with special expertise in high-end, non-branded hospitality properties. Snyder Nationwide, also develops and owns hotels and resorts in the southwest. Specializing in the repositioning of hotels in upscale markets that have a high degree of business travel. One of their recent redevelopments located in Silicon Valley won an international first place award for “Design of the Year” from Hospitality Design magazine.